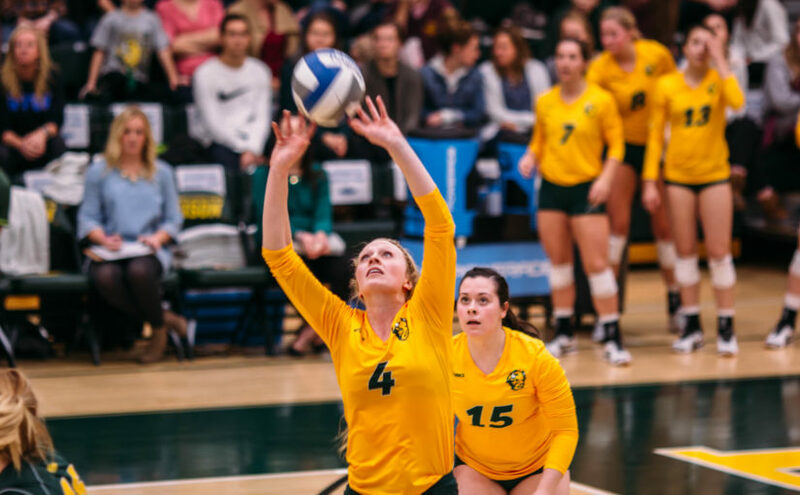 The North Dakota State volleyball team saw its season end on Saturday, thanks to a clean sweep by the University of Denver Pioneers 3-0 (11-25, 20-25, 22-25) in the semifinals of the Summit League Tournament. Things did not start well for the Bison as the tournament’s top-seed came out of the gates flying. A pair of service aces by Cassie Baird helped the Pioneers to a 4-0 lead before NDSU could get on the board. Denver would use three four-point runs and a six-point run to cruise in the first set. The Pioneers hit .412, committing just three errors in the first game. The Bison regrouped in the second set and found a balanced attack. While Denver once again jumped out to an early lead in the set, NDSU stormed back. Erika Gelzinyte capped off an NDSU 4-1 run with a kill to give the Bison an 11-10 lead. Denver responded with a 4-1 run of its own, including a pair of kills from Becca Latham. The Pioneers would not give up the lead again, despite the Bison getting multiple kills from Gelzinyte, Jessica Jorgenson, Bella Lien and Mackenzie Burke. An individual high-point came for Mikaela Purnell in the second set. The senior libero picked up her 600th dig of the season. Purnell joined Kari Fagnan as the only Bison to reach the 600-dig mark. The final set played much like the second. Denver used a 5-0 run to lead 12-4. NDSU started to chip away at the lead before getting a 5-0 run themselves to regain the lead. Gelzinyte’s ace gave the Bison their first lead of the set at 17-16. However, it would not be enough for the Bison, as Latham collected two more of her 20 kills down the stretch to bring the Pioneers to the tournament final. For the Bison, their season ended with a 19-9 record. Burke led the Bison with nine kills in the final game. Brianna Rasmussen had 26 assists, and Purnell ended with 10 digs. The matchup with Denver came after NDSU downed Omaha in the quarterfinals, 3-1 (21-25, 31-29, 25-15, 25-19) on Friday. The Bison started slow again. Omaha controlled the first set from the opening serve before going on a 5-0 run late that sealed the deal. It looked like the Mavericks would cruise past the Bison in set two as well. Despite dropping both games to NDSU in the regular season, Omaha found themselves up 7-2 early in the first set. The lead continued to grow until Sydney O’Shaughnessy registered a kill to make it 19-11 Mavericks. Then NDSU found their swing. Rasmussen, Burke and Allie Mauch tallied kills in a Bison 5-0 run that cut the lead to three. Gelzinyte gave the Bison a 23-22 lead and Rasmussen put the Bison on to set point, but NDSU could not get over the line. The two teams traded points until Jorgensen killed off the set at 31-29. The Bison maintained momentum in the third set, jumping out to a 4-1 lead. A 6-0 runs with kills from Lien, Rasmussen and Gelzinyte pushed the lead to 18-9. NDSU finished the set on a 5-0 run. The Bison hit a solid .306 in the set. The fourth set went a similar route. Burke struck two kills in a Bison 5-0 run to make the lead 10-2. NDSU was steady throughout the final set, and Burke tallied her team-leading 13th kill of the afternoon to advance the Bison. Rasmussen finished with a “triple-double” with 36 assists, 12 digs and 10 kills. Purnell collected 25 digs for the 10th time this season.